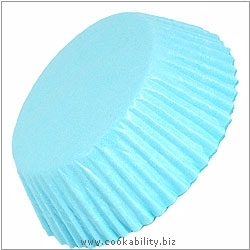 Perfect in baby blue glassine for mini cakes at Weddings, Christenings or just when you want to coordinate. Supplied in a polypropylene container for easy storage. Dimensions: 73mm base, 34mm high.